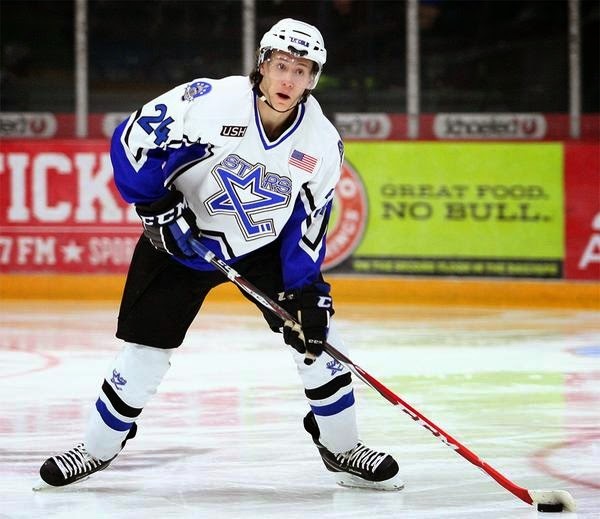 Congrats to Lincoln Stars defenseman Cam Lee who was named the USHL CCM Defenseman of the Week today by the league. The defenseman scored a goal in both contests and posted a plus-four rating as the Stars split a weekend set against the Muskegon Lumberjacks. He netted a goal in the first period of Friday’s 3-2 loss and equaled a game high plus-two rating. The 17-year-old then netted his second goal of the weekend in Saturday’s 4-3 victory and again tied a game high plus-two rating. Lee has now scored a goal in three straight games for the Stars and has tallied those three goals on just four shots. The Ferguson’s Cove, Nova Scotia native is playing his first USHL season and is committed to play NCAA hockey at Providence College. Nice for the Stars (and Cam) to get some recognition so soon after the season started. Cam had a big weekend and will be counted on to have many more this upcoming season as one of the top offensive defensemen on the Stars. Congrats again to Cam! Well deserved. Awesome job Cam, this isn't going to be the only time he gets this award this season. Quick question yeti...was wondering if you have heard anything about K. Ward? Ward was traded to Muskegon for (F) Chris Dodero. I posted the news on Twitter, as did the Stars. I've been busy so I haven't had time to put up an article about it just yet. I hope to do that soon.